Bryan Nelson is a philosopher, freelance writer, adventurer and political activist originally from the Bay Area, California. His diverse passions include philosophy, travel, art and culture, film, the biological and cognitive sciences, environmentalism and sustainability, international politics… and potato snacks. He has traveled extensively, and has recently returned from backpacking South America and Europe. He has two Bachelor’s Degrees in Anthropology and Philosophy from S.U.N.Y. at Oswego, and a Master’s Degree in Philosophy from the University of Houston. His multifarious and comprehensive philosophical work has emphasized studies in the Philosophy of Mind, Embodiment, Pragmatism, Existentialism, Epistemology & the Philosophy of Science (esp. Philosophy of Biology). You can check out Bryan’s blog on the Philosophy of Embodiment which he maintains here. Bryan’s writings can also be found on Animal Planet, the Mother Nature Network, as well as at WhoGo at their Australia Travel Guide. 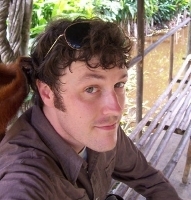 He has also contributed to Brave New Traveler and the Matador Network, and he is the managing editor at Expatify.com. He currently resides in Kihei, Maui. Hi Bryan, I have just discovered your excellent embodiment website and was wondering if you still update it (the last post was January: I feel like I missed the party). Either way, it’s a really nice blog (as is Meanering with Intent)! Unfortunately, no, I do not still update it. I would like to, and I still have intentions for it. But right now I just simply don’t have the time for it. I’m too spread thin writing elsewhere. Thanks so much for reading it, though. For the time being, it’s just a lack of time and funds for it. I’ll let you know if and when I continue with it, though! Thanks Bryan, it’s still a useful resource so I won’t hesitate to link to it when I next post about embodiment. I read your blog for the first time today and found it very thought provoking. You cast the Republican Party as the villain but never mention the Democratic Party. I understand that the blog was written in the early days of Mr. Obama’s presidency but wouldn’t you agree that his bail outs put him squarely at the head of the line as chief villain and the one person that needs to be voted out of office? Secondly, do you not see a differance between capitalism and corporativism? I look forward to more thought provoking blogs in the future. Thank you. Bryan, though I do not exactly agree with your list of 20 “most important” philosophers, but I appreciate your attempt. Beyond that, I am glad to learn that not only you have a good mind, but also the spirit of an activist who cares about environment, sustainability and international politics. I hope the best for you.